Liberty University has announced Dr. Ed Hindson as its new dean of the School of Religion. Hindson has served at Liberty for more than 20 years, including the past 14 years as a distinguished professor of religion. Hindson replaces Dr. Elmer Towns as dean of the School of Religion. Hindson holds three doctoral degrees: Doctor of Philosophy from the University of South Africa, Doctor of Ministry from Westminster Theological Seminary, and Doctor of Theology from Trinity Graduate School of Theology. He has master’s degrees from Grace Theological Seminary (Th.M.) and Trinity Evangelical Divinity School (M.A.). He is also a fellow of the International Biographical Association, Cambridge, England. He first taught at Liberty from 1974-86, during which time he recorded the first class on tape for Liberty’s then School of Lifelong Learning. That was an early offering of Liberty’s innovative online education program, which this year alone will make higher education affordable and accessible to more than 90,000 individuals across the world. Hindson returned to Liberty in 2000 after serving in a number of leadership roles in ministry and Christian education across America. He has spoken innumerable times in churches all over the country and has lectured at a number of prestigious universities, including Westminster Theological Seminary, Harvard Divinity School, and Oxford University’s constituent Balliol College. For the past 13 years, Hindson has been the featured speaker on “The King is Coming,” an international television program. He has authored 40 books and is a winner of the Gold Medallion for excellence in Christian authorship. 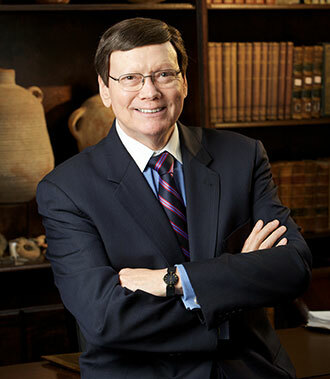 He has edited five study Bibles, including the Thomas Nelson King James Study Bible, the best-selling KJV study Bible in the world with more than 2 million copies sold. As dean, Hindson intends to build upon the School of Religion’s legacy of excellence and maintain its theological integrity. This includes challenging the existing faculty to help mentor younger faculty and continuously revising the curriculum to ensure relevance and employment value. “I really believe in what the School of Religion means to the wider institution. 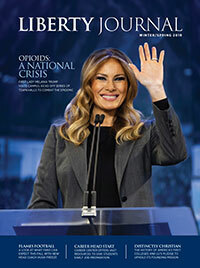 The core competencies in Bible, theology, and evangelism have always been part of the real heart, passion, and soul of Liberty,” Hindson said. “It has made us unique and distinct from many other Christian institutions.